The TR1 (60590-01) headset adapter was originally designed for and packaged with the Plantronics CS55H wireless headsets. This headset was designed for use on a cordless phone with a single line coming in. In time we here at Headsets Direct discovered plugging the TR1 adapter into the extra AUX jack on the Avaya Partner phones worked just like an EHS adapter. It will work on any of the old/new CS series wireless headsets and on any of the old/new Savi series wireless headsets. In the past the only way you could get the TR1 was to purchase the CS55H headset. 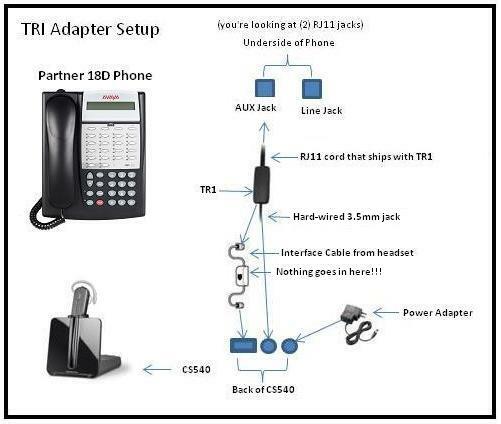 We now offer the TR1 as an individual item that can be purchased for just $50, no lifter required when used on the Avaya Partner phones. 1. Take the cover off the bottom of your phone; right next to the line jack you will see an empty AUX jack. 2. The TR1 ships with (2) cords, the cord with the RJ11 connector (this cord will unplug from the TR1) plugs into the AUX jack on your phone. The other cord is hardwired to the TR1 adapter. 3. The hardwired cord on the TR1 plugs into the back of the wireless headset charging base (it will only fit in one place). 4. The newer models of headsets ship with an Interface cable. The small end of the Interface cable plugs into the empty jack on the TR1 and the large end of the Interface cable plugs into the back of the wireless headset charging base. 5. Plug the power adapter into the back of the charging base. Now it’s just a matter of pushing the call/control button on your headset to answer a call or to place a call. See diagram for detailed instructions. Yes, the TR1 will allow CS wireless headsets to be used for home single line usage. You can answer by pushing the on/off button. For making calls, an alternate telephone with a keypad is required.